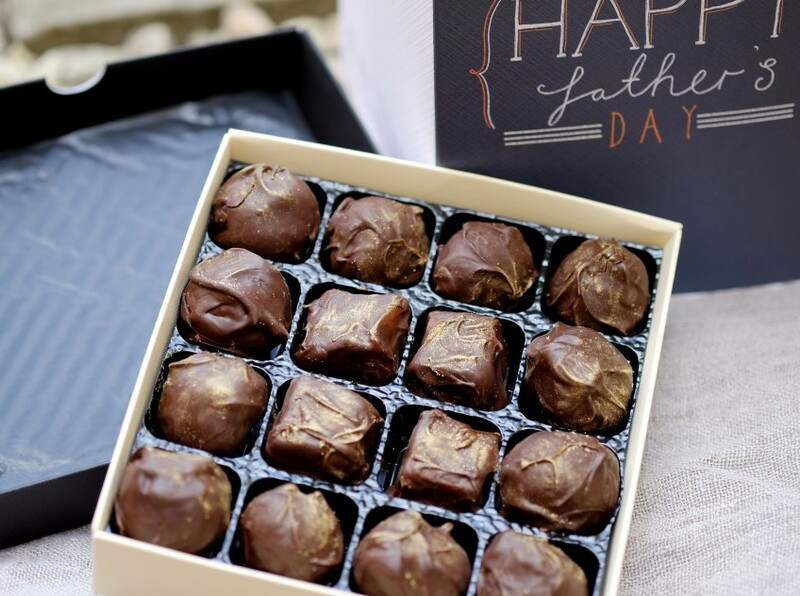 I made these hazelnut truffles for Father’s Day, but I was a bit delayed getting them up on the blog. I managed to get them to my Dad in time for Father’s Day, he was very impressed that I’d gone to the trouble of making them, they won me some serious daughter points! I felt a bit guilty because they really aren’t difficult to make at all. These make a perfect thank you gift, or just a small treat to have in the house for when you need a little indulgence. You can make the ganache, roll it into balls and coat them in cocoa powder, or you can go one step further and cover them in tempered chocolate as well. The gold dust I found lurking in the back of the cupboard and I thought it made these look extra special. In this box of chocolates I also included some chocolate covered caramels, you can find the recipe for the caramels here. Increase the salt to 2 teaspoons and don’t sprinkle any on top of the caramels. 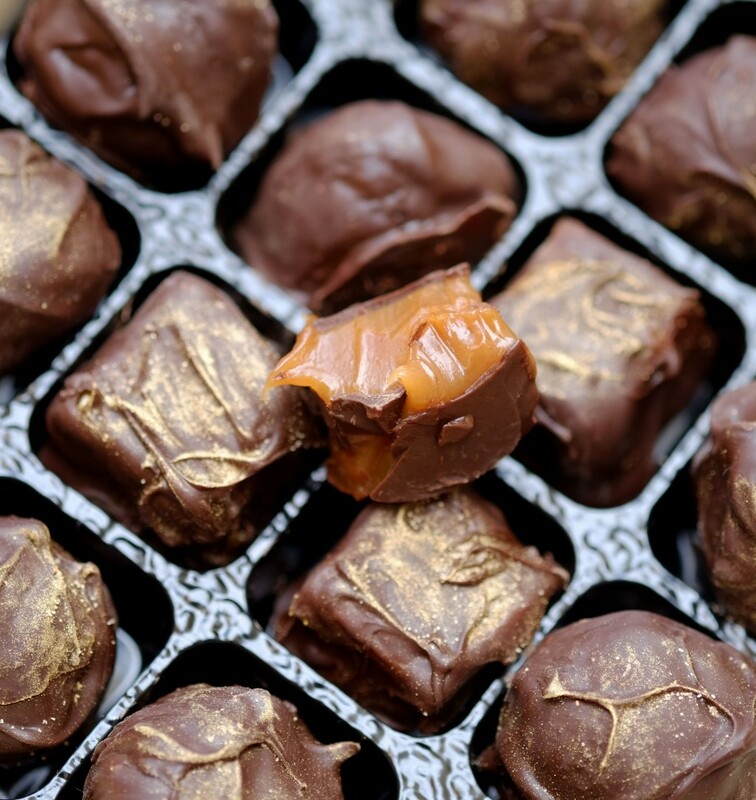 To coat the caramels you need to cut them to size and place them back in the fridge or the freezer so that they are nice and cold for dipping in the tempered chocolate. A delicious Hazelnut truffle covered in tempered chocolate. A perfect gift to say thank you, or just to show you're thinking of them. Put the chocolate into a bowl, snap it up into squares or chop it into smaller pieces if necessary. Place the hazelnut paste, brown sugar, whipping cream and fleur de sel in a saucepan and bring to a gentle boil. Stir regularly to make sure the hazelnut paste is mixed in with the cream and that there aren't any lumps. Add the hot cream mixture to the chocolate and stir until it has all melted and mixed together. Cover with clingfilm, pressing it against the ganache so that you don't get any condensation and place the ganache in the fridge to set for at least 4 hours. Take teaspoonfuls of the ganache and roll them into balls. Coat the truffles in cocoa powder and return them to the fridge, you should end up with around 20-25 truffles. Next temper your chocolate, take 200g of the chocolate, place it in a bowl over a pan of barely simmering water. Melt the chocolate to 45C - this will take a bit of time and you will find you have some pieces of chocolate that haven't fully melted. Still remove the bowl from the heat as the rest of the chocolate will melt. Don't be tempted to heat it to more than 45C. Add the remaining 100g of chocolate to the melted chocolate and stir until it all melts. You might need to add more chocolate, you want to lower the temperature to 29C, then place the bowl back on the pan and use the residual heat to raise the chocolate temperature to 32C. You can now coat the truffles in the tempered chocolate, to coat them use your fingers and swirl them around in the chocolate and allow the excess to drip off. Place them on a piece of greaseproof paper or on a silicone mat to set. If you want, you can dust these with gold dust. If you cover the truffles in tempered chocolate, they can be stored outside of the fridge in an airtight container for a couple of weeks. If you only cover them in cocoa, store them in the fridge and eat within two weeks. Oooooh, I would love to make these, but grams to ounces conversion has never worked well for me. Are you using digital scales? If so they should be able to tell you the weight in grams? Truffles like these would probably work pretty well if you tried converting them, and you could just hand roll them if you wanted. Thank you so much. I will check out my scale and see if it offers both units of measure. I didn’t think of that, lol. Oh em gee, Angela! 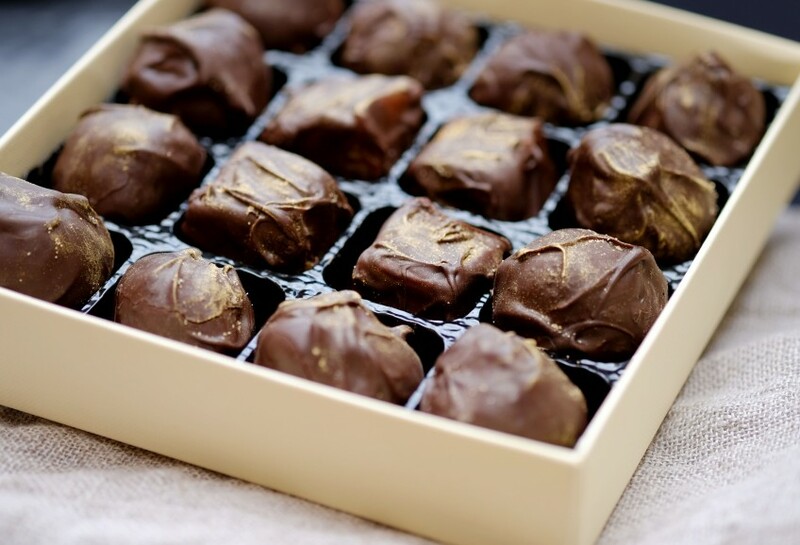 These truffles look like perfection! I’ve seen a lot of homemade truffles, but these are the closest to the real deal you buy at the chocolate shop. That chocolate covered caramel? Holy moly…my favorite!! I love your detailed notes too for tempering chocolate as I’ve always wanted to try my hand at that. This recipe looks like the perfect place to start 🙂 Thank you!! Wow thanks Beeta, the ultimate compliment. I love the idea of these looking like the truffles you’d buy from a shop. Tempering chocolate isn’t too difficult, it just takes a bit of time so don’t be tempted to rush it. It’s also easier if you have a good couverture chocolate to work with, something like Amedei, Valrhona, Callebaut are all good. After you’ve mastered tempering you can make some amazing chocolate decorations. How I love chocolate and these look amazing, the perfect gift, perfect for me too! Thank you so much for such wonderful comments. They are delicious chocolates and they would be perfect for you too.